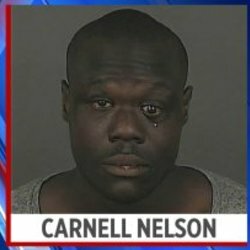 Carnell Nelson, 29, walked into the 7-Eleven store at 551 E. Colfax Ave., took the cash register and left the store. A store employee flagged down officers who were on routine patrol. When the officers saw the suspect they started running after Nelson and began to approach him when the suspect pulled out a gun and started shooting at officers. One of the officers, Travis Lloyd, returned fire and was hit by one of Nelson's bullets in the thigh. The suspect was taken down by the officer's bullets and Lloyd's partner put a tourniquet around his leg until other officers arrived on the scene. Both officers have been with the department for three years. Lloyd has been placed on administrative leave while the incident is investigated. Two bystanders also suffered injuries in the crossfire. Nelson died as a result of his injuries. In October 3, 2018, the Denver District Attorney's Office said the police officer was justified in shooting Nelson and will not face charges.